It still took us a bit over a year though, before we got our own, as it is quite an expensive ‘toy’ (about $800!) and I really had to find a way first to look beyond the ugly color, the shape and outside texture of this miraculous cooker. 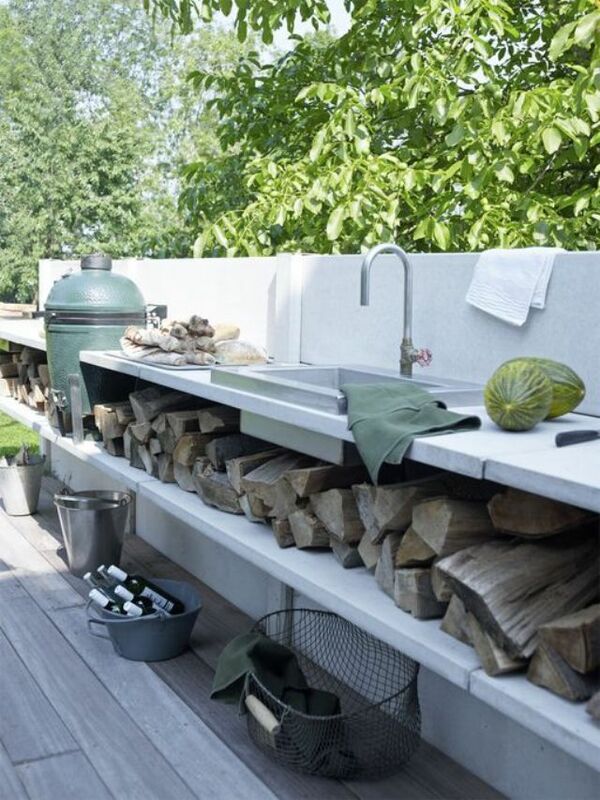 It is absolutely thanks to the unparalleled quality of the dishes, made with the egg, and the amazing outdoor kitchen design (with the green egg integrated) by compatriot Piet-Jan van den Kommer, that gave us the final push to buy one on my husbands birthday last month. I will definitely share some of our culinary adventures in the near future, but for now I simply wanted to focus on ways to stylishly integrate this culinary wonder outdoors. So for all food lovers out there, looking for BGE built-in possibilities, I have gathered the pictures that have convinced me! Let me know what you think! (*) For those who are not (yet) familiar with this cooking sensation, the Big Green Egg is a grill, an oven and a smoker all combined in one American designed ceramic outdoor cooker, producing amazing culinary results. Which probably explains why so many top chefs, even in some of the most acclaimed restaurants around the world, are now also using the big egg in their professional kitchen! Really love it!!!!! And the food………………..WOW! With thanks to two great chefs……………. Beautiful settings! Maybe need to do just a little more changing to our backyard….. So glad to hear you got an BGE, and I am not sure why I have not cooked anything for you on ours! Looking forward to seeing some of y’alls creations! Let’s celebrate the start of the summer in our backyard trying out new creations! …zou in jullie achtertuin ook niet misstaan! Regel ik de kok! Exactly the ones you think I am talking about!